When Diego Luna's second directorial effort opened quietly this past weekend I was quick to associate it with another recent biopic of an important historical figure that floated under the radar last awards season and never picked up the steam to garner the recognition I felt it deserved. I, more than most, truly enjoyed Mandela: Long Walk to Freedom and the fully invested performance of Idris Elba that turned the film into a powerful statement showing that while working with a bigger life than a single film could capture, one is still able to capture the intended scope and impression the subject leaves behind them. I knew little of Mandela before seeing the film besides his stint in prison and the same could be said about Cesar Chavez whose name I only associated with his hunger strike that I'd read and learned about so long ago I couldn't tell you who taught it to me. Luna's film attempts to do very much the same things as Justin Chadwick's take on the South African President and while the struggles they fight for are both radically different and virtually the same in terms of basic human rights, the films seem to follow the same rules in how they mean to convey all the information necessary to create a compelling narrative within the time span of two hours (give or take a few minutes on either). This similarity from a standpoint of storytelling makes Chavez's plight no less admirable in the context of the film and because Luna is still somewhat of a novice filmmaker in the sense that his material here, while no doubt a passion of his and a subject he is well educated on, can still be overwhelming and this becomes clear as the way in which this story is conveyed feels all to safe and well-constructed to be about a man who took the necessary risks and was an intelligent strategist allowing him to outwit his opponents in the game of pride he often found himself playing. There is of course the obvious fact that because the plight of Chavez is interesting and compelling on a basic level that the movie will inherently share some of these elements and while it is also clear the film comes from a place of good intentions with true heart behind it that unfortunately can't always make up for the simple lack of insight and freshness that feels sorely lacking here. 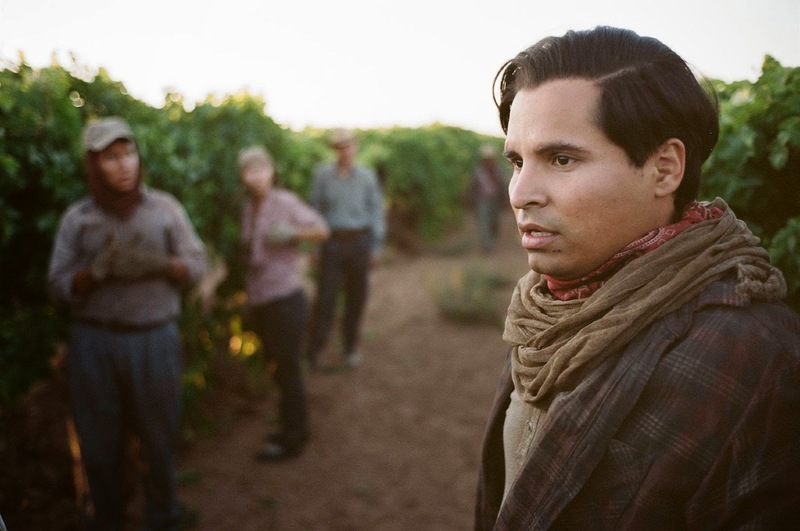 Cesar Chavez (Michael Pena) feels the need to change the conditions of the Latino farm worker. The film begins in 1962 as Chavez (Michael Pena) moves his family, including his wife Helen (America Ferrera) and oldest son Fernando (Eli Vargas), from San Francisco to Delano, California where he is able to get out of his office as the organizer for the Community Service Organization (CSO) and actually begin to at least feel like he is making a difference for the field workers that are getting paid paltry amounts while the owners of the fields sit in their mansions overseeing the slave-like conditions with only slightly better reward. It is around this time that he formed the National Farm Workers Association (NFWA) with Dolores Huerta (Rosario Dawson) and we see the skill in how Chavez knows he will have to play the game to get what he wants beginning to show through. To give their organization credit he and Huerta start a credit union, lending the people what they need to help them get by on what their wages won't cover while unanimously publishing an NFWA newsletter that simply conveys the point of their cause. In gathering such a following suspicions begin to arise from the locals who naturally bring in their law enforcement who unnecessarily begin to bully Chavez and his followers because they assume he is up to no good and they don't have a high toleration for "subversers". By 1965 Chavez had built a strong and loyal following and the Filipinos had begun going on strike due to the farmers going one step too far in cutting back their wages and as retaliation the farmers brought in more Mexican Americans and no doubt more than a few illegal aliens to do the work those on strike weren't willing to do. Chavez, causing waves with the farm owners, united the farm workers and began to rally everyone to go on strike and for the rest of the country to not buy the grapes in which these farms were producing, preaching that unity will be the only way to really make for change in their future. 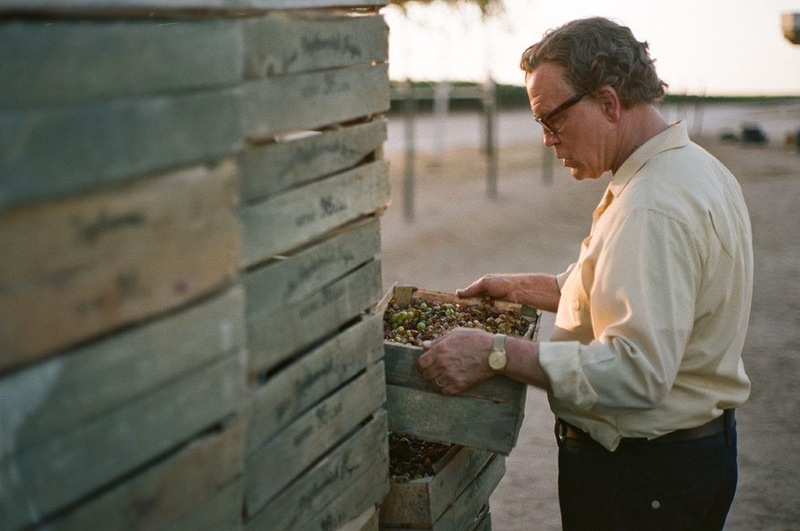 The film uses wealthy farmer Bogdanovich (John Malkovich) and his son (Gabriel Mann) to manifest the main antagonist of the film and Chavez's cause while highlighting a few of his fellow farm owners that begin to feel the repercussions of these strikes. While, at first, these men believe they will be able to control the situation with local law enforcement alone (incarnated by Michael Cudlitz) after Sen. Robert Kennedy (Jack Holmes) becomes involved and throws his favor towards Chavez things enter a whole new arena that, along with his famous twenty-five day fast, catapult Chavez and his cause into the national spotlight. While the film draws heavily on the events through which Chavez changed the landscape of the field worker conditions in California through his civil rights activism, it is also keen to show how this struggle affected his personal life and in particular his relationship with Fernando. There is a moment early on in the film where, after the family has moved to Delano, Cesar learns that his son is being picked on at school due to little more than his heritage and has subsequently been involved in a few fights because of it. Cesar asks if he started the fight, to which Fernando replies, "I told you they called us names." Fernando comes back with the attitude he knew his father wouldn't understand when Cesar tries to turn the situation into a lesson in always having a choice. While his parenting skills and level of understanding with his child could no doubt use a little work his lesson isn't wrong and it influences his own philosophy as he continues to justify pushing forward with his cause rather than taking the easy road and simply letting things fall where they may. 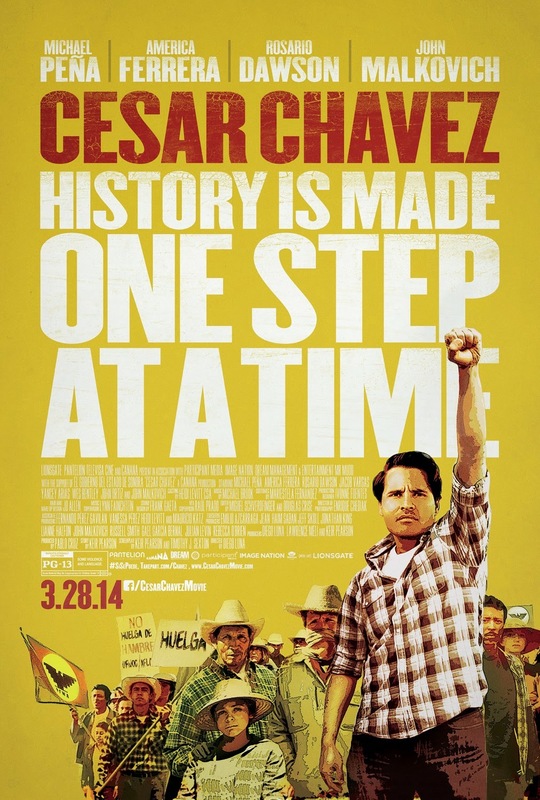 This larger theme of what you decide to do, what path you decide to take begins at an early point in the film as this small conversation between father and son, but as things with Chavez's cause continue to gain momentum it becomes a defining trait that keeps Chavez and his supporters moving forward. When trying to transform the established order of something, in disrupting the structure of power you immediately make people uncomfortable because it is nothing but scary change at first glance, but what comes to light despite these strong ideas themes and inherently strong story is that this attempt to reverse the values and principles of a system never come across with the level of complexity as they seemingly should in the film. As I watched and as the struggle portrayed on screen continued to unfold I understood what was going on, it all came through coherently, even with my unfamiliarity to the the subject matter, but what seemed obvious was that it had been altered and stripped of the intricate aspects that would likely have made this a more intense and engrossing study of how non-violence and intelligent strategy is as good a substitute for brutality than anything. Much can be made of films that consistently deliver scene upon scene of crisp and decisive dialogue that cuts to the heart of the matter at hand and explains it effectively and eloquently, but Keir Pearson's (Hotel Rwanda) screenplay prefers to go the more straightforward route in documenting certain events and streamlining how Chavez made it from point A to point B that leaves us feeling more uninvolved than anything. Simply known as Bogdanovich (John Malkovich) is our wealthy antagonist in Cesar Chavez. What was even more shocking in this regard was the way in which the film documents what Chavez is arguably the most famous for: his fast that served the purpose of uniting those supporting him in promoting the principle of nonviolence. This defining act feels skimmed over in the larger scheme of the film as it jumps from the day he reveals he hasn't eaten in three days to the eighth day where we see things beginning to take a toll and then completely over what were likely the hardest of days, that middle section, to day twenty-one where Chavez seems so fatigued and weak by his experience that he can't even feel the pain anymore. This act was meant to symbolize not only a defiant spirit in terms of things being done the way he wished, but to show his true dedication to how much he believed in what his organization was doing and what they stood for, but the film, in the same way it seems to only skim the surface of Chavez's many complexities isn't able to appropriately convey a true sense of the depths our titular character is taken to during this fast. While Pena certainly gets across the point physically and in being an exceptional and diverse actor anyway we appreciate all that is done here to not only let the audience see why Chavez has become a cultural icon, but to actually flesh him out as a man in day to day life. Still, it is Luna's conventional approach to the subject matter that leaves us wanting more, that leaves us interested in how someone goes from not eating for nearly a month to simply walking the streets of London and visiting radio shows with no hint of a real transition from this world of hopelessness and desperation to one where everything seems to start going his way. While Pena does in fact give as fine a performance as he is allowed it is the character development that is cut short by the scripts inability to branch out from the beaten path where our protagonist has little more to do than recite the same speech in different ways while never truly letting us into his brain. In the end, it commits the ultimate crime of turning an admirable and complicated man and subject into something with no compelling drama for the audience to really invest in. The strong female supporting cast that features Dawson, Ferrera and even the presence of someone like Malkovich are treated as nothing more than simple archetypes present to move the story of Chavez forward, but there is no connection to them formed and no sense of why they are either supportive or frustrated with our hero other than the fact that they are supposed to be. This could sum up my feelings about the film as well in that, despite its humble beginnings, feels more like something made out of a feeling of it being necessary rather than that of an organic push to want to tell this mans story.